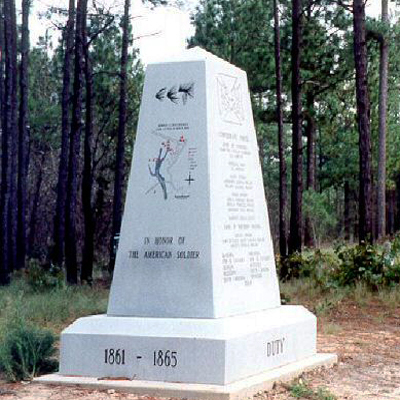 Source: Battle of Monroe’s Crossroads Monument, Fort Bragg. Photo courtesy Fort Bragg, NC Cultural Resources. The short, obelisk-style monument is dedicated to the Battle of Monroe’s Crossroads. On either side are listed the respective Confederate and Union divisions involved in the battle, and on the rear of the monument is a map of the battle. The base of the monument is inscribed with the words “DUTY- HONOR- COUNTRY”, which is the motto of the United States Military Academy, because many of the officers involved were graduates of the academy. The monument measures about 8 feet tall by 3 feet, 5 inches wide, and the square base measures 14 inches tall by 5 feet wide. William H. Kern proposed the monument in the late 1980s. The battlefield was selected as important to commemorate because of its pristine condition. In the 1990s, an extensive archaeological effort was undertaken to properly identify the grave sites. Cultural Resources Management Program, a branch of Directorate of Public Works’ Environmental Division, Fort Bragg. The monument was placed in 1996 but there was no formal dedication ceremony. On March 10, 1865, Confederate Cavalry under Lt. Gen. Wade Hampton launched a surprise attack on the camp of Union Cavalry under Brevet Major General Hugh J. Kilpatrick at the Charles Monroe farm. While the Confederates raided the camp, the Union soldiers launched a successful counterattack. The battle ended inconclusively, but was one of the largest all cavalry battles of the war. This monument is one of few in North Carolina dedicated to both Confederate and Union forces. A few years before the monument was approved and created, a controversy arose at the nearby Bentonville Battleground in Johnston County over a veterans’ group’s proposal for a monument dedicated to the Union soldiers lost in the battle. Specifically, Secretary of the North Carolina Department of Cultural Resources Betty McCain rejected the proposal because it would commemorate General William T. Sherman’s infamous march to the sea. The State Historical Commission denied the request for the monument. This controversy impacted the approval of the Battle of Monroe’s Crossroads monument, which was agreed to as long as there would be no formal dedication or publicity, so as not to involve Fort Bragg in any local politics. The monument is located near a marker to the battle. Also in the battlefield area are a sign marking the site of Kilpatrick’s camp, a mass grave, and grave markers to soldiers both known and unknown. The monument is located on Monroe’s Crossroads Battlefield, part of Fort Bragg. The monument was placed on the highest point of the battlefield, next to a mass grave holding both Confederate and Union dead. The approval process for the monument took about 10 years because of the related controversy in Bentonville, but was finally approved by the Garrison Commander of Fort Bragg under the condition that there be no formal dedication or publicity.